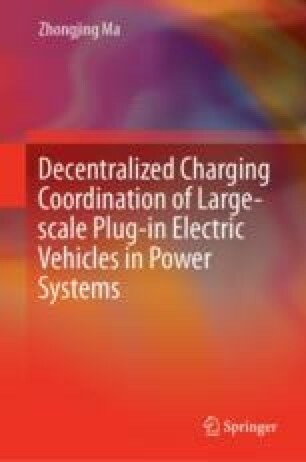 This work is concerned with large-scale incorporation of PEVs, which are typically inter-temporal shifting loads, into an electricity markets over multi time intervals. In the context of deregulated market structures with deep concerns for the social efficiency, demand response (DR) is promising to enable interaction of PEVs with the grid. It designs a decentralized dynamic pricing mechanism for DR based on auction rules, to induce PEVs to behave efficiently and obtain system wide benefit. The system implements an optimal allocation with respect to the submitted bid profile, and broadcasts an associated system price to all the PEVs. The expected system price dictates PEVs’ best response; on the other hand, the resulting PEV pattern will alter this price. Moreover, it proposes a dynamic algorithm to implement the efficient results such that all the PEVs simultaneously update their best responses with respect to the threshold price set in last step. It specifies the sufficient conditions for the proposed method, under which the system converges to the efficient solution.